Borer, a Nebraska native and 2002 Wahoo Bishop Neumann graduate, comes to Mount Michael Benedictine after serving as the head coach of Thomas More Prep-Marian, a 240 student coed boarding school in Hays, Kansas, for the previous two seasons. Borer was instrumental in helping Thomas More Prep have its first winning season since 2003 and compiled a two year record of 7-11. Borer’s 2011 squad went 5-4 and was one win away from the Kansas state football playoffs. 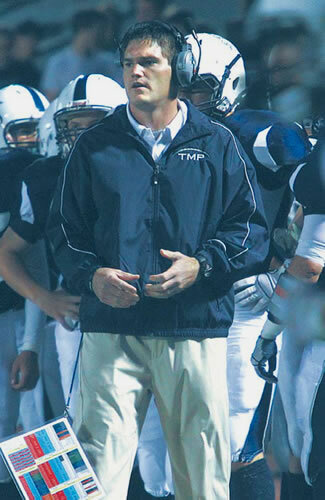 Prior to coaching at Thomas More Prep, Borer served as the offensive coordinator at Nebraska City Lourdes where his teams set school records for passing and offensive yardage and finished ranked in the top five in Class C-2. Borer was a four year starting quarterback for Briar Cliff University in Sioux City, IA where he completed his degree in secondary education. At Mount Michael Benedictine, he’ll replace Dave Plendl, who resigned at the completion of the 2011 season. Borer is very familiar with Mount Michael Benedictine’s excellent academic and athletic reputation having competed against Mount Michael Benedictine teams throughout his high school career at Wahoo Bishop Neumann.